_"How much will they cost?" Determines how much it costs to buy a specific number of shares. 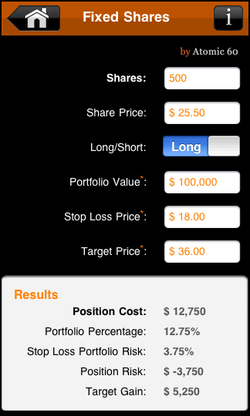 Also calculates portfolio position percentage, dollars at risk and possible gains. I want to buy (long) 1,000 shares of stock ABC at $10.00. My portfolio value is $100,000. Trade comm. is $6.99. Buying this stock will cost me $10,007 and will be 10% of my portfolio value. If I sent my Stop Loss at $6.00, my portfolio risk is 4.0% or $4,014.